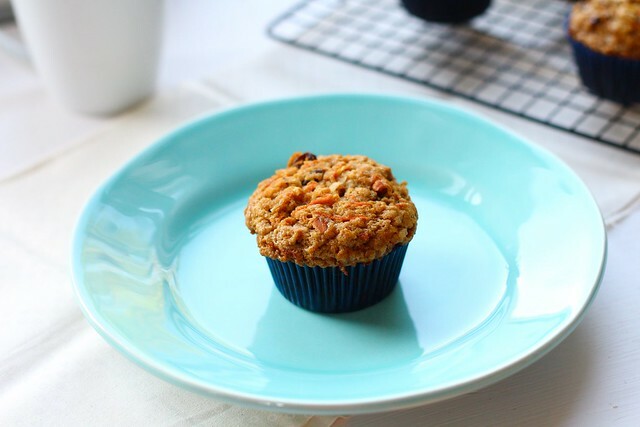 Muffins are the greatest excuse to have cake for breakfast. Whoops, I mean, you should always start your day with a healthy, non-dessert-like meal. Fail. 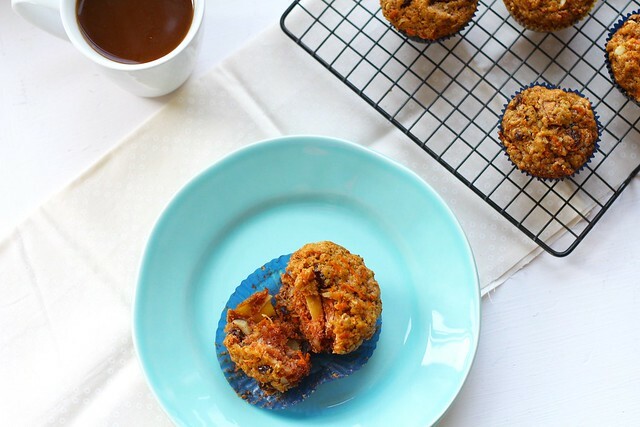 Well, luckily (for me at least), these muffins are actually healthy. Full of bright color, big chunks of fruit and (gasp!) even a vegetable! And if you are really feeling fabulous, you can play around with substituting honey for the oil and sugar. Even my little cutie pie got to help me. These muffins were a great pick-me-up on this dreary, rainy day. As well as my all-time favorite coffee; 44 North. You can't forget coffee. Preheat the oven to 350 degrees. Have ready two muffin tins lined with papers or greased. In a medium mixing bowl, whisk together the flour, sugar, baking soda, cinnamon, nutmeg, sand salt. Stir in the nuts, carrots, raisins, coconut and apples. Making sure everything is coated well with flour. In a small mixing bowl, whisk together the eggs, oil and vanilla extract. Stir the egg mixture into the flour mixture. It is a very lumpy, thick batter, so make sure the flour is completely incorporated, or there will be dry spots in the muffins. Fill the prepared muffin tins about 3/4 full. Bake for 20-25 minutes, or until a toothpick inserted in the center of a muffin comes out with just a few clinging crumbs. Let cool for 5 minutes before removing from the muffin tins. Store in an airtight container up to 3 or 4 days in the refrigerator, warming up before serving.